Keith Thorpe/Peninsula Daily News Port Angeles’ Skyler Cobb putts on the second hole at Peninsula Golf Club on Wednesday in Port Angeles. PORT ANGELES — The Port Angeles boys and girls golf teams had trouble with wet and windy conditions in falling to Klahowya in matches held Wednesday at Peninsula Golf Club. In the boys match, the Roughriders were upended 199-190. Skyler Cobb and Derek Sparks led the Roughrider boys with nine-hole rounds of 49. Ryan Wolfgang contributed a round of 50 and Cameron Fouts added a 51. Klahowya’s Landon Betzing led all players with a low round of 42 to earn medalist honors. In the girls match, Port Angeles fell 266-203 to the Eagles. Kat McMahan led the Riders with a 61. MaKayla Peabody added a 66, Katie Marchant a 69 and Bronwin Davis a 70 for Port Angeles. Klahowya’s Emi Brown posted a 42 to earn medalist honors. The Rider boys (4-3) and girls (2-5) golf at North Mason on Tuesday. SEQUIM — Maddie Uranga led the Wolves with a 47 on a windy and cold par-36 front nine at Cedars at Dungeness. Uranga tied for medalist honors with Bremerton’s Lily Gelhaus. Brittney Gale also played well for Sequim with a round of 48. JoNell Hill and Jessica German each shot 51s for the Wolves. Claire Payne (67) and Kaylee Dunlap (59) also played in their first varsity match for Sequim. Sequim (3-2) hosts Port Townsend, North Mason and Chimacum on Monday. PORT ANGELES — The Roughriders’ 50-game Olympic League winning streak came to an end with a loss to the Trojans on Wednesday. Port Angeles’ (3-1, 4-4) last Olympic League defeat came May 16, 2014 against Sequim in an Olympic League title tiebreaker. The Riders did fall 6-5 to the Wolves last season, but that contest was a non-league game. Trailing by two runs in Port Angeles’ last turn to bat in Wednesday’s game, the Riders opened the bottom of the seventh with a double by Zoe Smithson. Olivia Nevaril singled with two outs and Madi Roening walked. The rally was cut short, however, when Lucah Folden flied out to left field to end the game. The Riders pounded out 22 hits, but allowed 13 hits and committed five errors. Smithson, a freshman, totaled three extra-base hits (a triple and two doubles); Roening homered and doubled twice and freshman Peyton Rudd added two doubles. The defeat bumps Port Angeles into a three-way tie for second in the Olympic League behind North Kitsap (4-0, 6-2). The Riders host the Vikings today at 4:15 p.m. at Dry Creek Elementary. 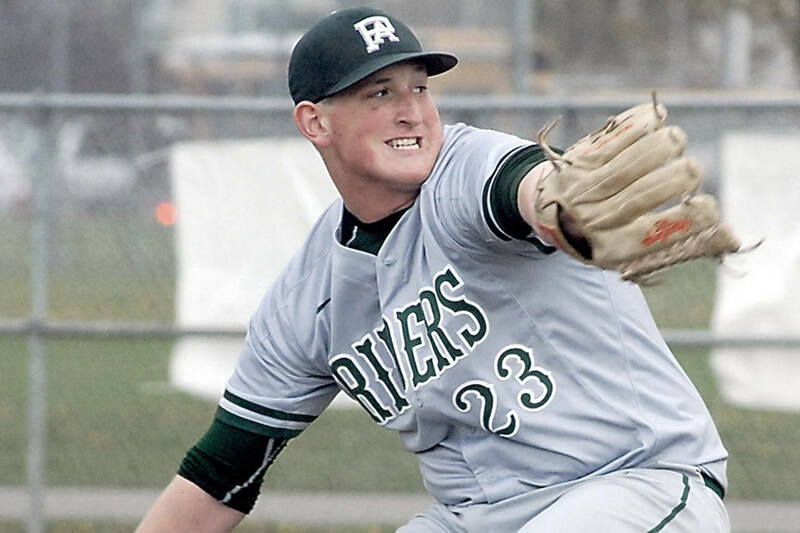 Port Angeles — Watson 0.0 IP, H, R, ER; O’Connor 6IP, 9H, 9R, 4ER, 2BB, 5K; Holland IP, 3H, 4R, 3ER. Port Angeles — Smithson 4-5, 3B, 2 2B, R, RBI; Roening 3-4, HR, 2 2B, BB, 2R, 4RBI; Rudd 2-4, 2 2B, R, 2RBI; Cargo-Acosta 3-5, 2B, R, RBI; Nevaril 4-5, 3R, RBI; Folden 3-5, R, Holland 2-4, R; O’Connor 1-5, R, RBI. KINGSTON — The Wolves opened up an early 6-0 lead and never looked back in an Olympic League win over the Buccaneers on Wednesday. Bobbi Sparks led the Wolves with three hits. Christy Grubb, Jayla Julmist, and Kiana Robideau all had two hits apiece. Sequim (3-1, 5-2) is tied with Olympic and Port Angeles for second place in league play and hosts the Trojans today at 4:15 p.m. PORT ANGELES — The Roughriders walked all over the Trojans, drawing 12 walks and two hit batters, and received an excellent relief appearance by Jaidon Seibol in a win over the Trojans on Wednesday. Milo Whitman led the Riders at the plate, driving in four runs on two hits and a sacrifice fly. Bowen pitched a clean seventh inning to preserve the victory. “Bowen came in and pounded the zone pitching with a lead against the heart of their order and did a great job closing out the win,” Myers said. First place in the Olympic League is on the line today at Civic Field when Port Angeles (5-0, 8-3) hosts North Kitsap (5-0, 9-3) at 4:15 p.m. Port Angeles — Adams 2.2IP, 4H, 5R, 0ER, BB, 2K; Seibel 3.1IP, H, BB, 7K; Bowen IP, H, ER, K.
Port Angeles — Whitman 2-4, 2R, 4RBI; Bowen 2-4, RBI; Flodstrom 1-2, 2BB, 2R, RBI; Jarnagin 1-3, BB, 2R, RBI; Wood 1-4, BB, R, RBI; Hall 1-3, BB, RBI; Basden 0-2, 2BB, R, RBI. KINGSTON — Johnnie Young pitched a complete game, allowing three runs on eight hits and a walk while striking out six, as the Wolves triumphed on the road. Sequim scored all six of its runs in the third inning, taking advantage of two errors by the Buccaneers to take control of the game. Young opened the scoring with an RBI single to help his cause and the Wolves added runs on Michael Grubb’s fielders’ choice, an error and two-out RBI singles by Silas Thomas and Caleb Pozernick. Sequim (3-2, 7-4) hosts Olympic today. Sequim — J. Young 7IP, 8H, 3ER, BB, 6K. Kingston — Melzer 6IP, 5H, 6R, ER, 5BB, 4K; Whalen IP. Sequim — Pozernick 1-3, 2RBI; Thomas 1-2, BB, R, RBI; J. Young 1-3, RBI; Oliver 1-3, R, SB; Grubb 0-3, R, RBI; M. Young 0-3, BB, R, SB. Kingston — Sitting Dog 1-2, BB, 2RBI; Rutherford 2-3, R.
JOYCE — The Red Devils boys and girls claimed a North Olympic League meet held in Joyce on Wednesday. Neah Bay’s boys totaled 72 team points while Crescent posted 52.5 and Clallam Bay 23.5. Jay Brunk won two events for the Red Devils — the long jump with a season-best distance of 17 feet, 9 inches and the triple jump (36-06.5). Sophomore Eric Lyons set personal records winning the shot put with a throw of 32-07 and finishing second in the discus (76-05) for Neah Bay. Crescent sophomore Brendon Bergstrom had a new best in the discus with a throw of 80-09 and also set a personal record of 5-02 to claim the high jump. Clallam Bay junior Mike Maines had the best day for the Bruins boys, winning the 200 meters in 25.42 and taking second in the 100 in 12.18 to teammate Ryan Strid (11.93) and second in the high jump with a leap of 5 feet. On the girls side, Neah Bay won the meet with 61 points, while Clallam Bay posted 40 and Crescent 25. Zoey Wachendorf was a double-event winner for the Red Devils, winning the javelin with a throw of 61-04 and the shot put (20-0). Shilaily Woodruff won the triple jump for Neah Bay (27-08) and Laila Greene claimed the 800 meter run in 2:55.67. The Red Devils also won all three relay races. Ruth Greene, Branndi Bowechop, Grace Wilson and Navaja Johnson won the 4×100 in 1:04.51. Wilson, Woodruff, Laila Greene and Grace Buzzell teamed to claim the 4×200 (2:03.95) and Buzzell, Laila Greene, Woodruff and Isabell Parker won the 4×400 in 5:34.42. Clallam Bay seniors Hannah Olson and Miriam Wonderly each won two events. Olson set a personal record time of 13.85 in the 100 meters and also won the long jump with a distance of 13-09. Wonderly sprinted to a win in the 200 in 29.61 and the 400 in 1:10.96. Crescent eighth-grader Morgan Mattix earned wins in the 100 hurdles (20.56) and high jump (4-02) and was second in the triple jump (26-04) to lead the Loggers. All three schools will compete Saturday in the Forks Lions Club Invitational at Spartan Stadium in Forks. Keith Thorpe/Peninsula Daily News Port Angeles’ Derek Sparks takes aim on the pin on the second hole of Peninsula Golf Club in Port Angeles on Wednesday.